State-owned freight logistics utility Transnet reports that Werksmans Attorneys has been appointed to oversee a board-level probe into allegations of corruption relating to its purchase of locomotives from China South Rail (CSR). Opposition party the Economic Freedom Fighters (EFF) recently laid criminal charges against current and former Transnet executives, as well as Finance Minister Malusi Gigaba, in relation to the procurement of 554 electric locomotives from CSR across three contracts. The bulk of the allegations, however, centre on the purchase of 359 electric locomotives from CSR as part of Transnet’s R50-billion ‘10-64’ contract, which was divided between four suppliers. General Electric and China North Rail are supplying 465 diesel locomotives, while and CSR and Bombadier Transportation (BT) have been contracted to supply 599 electric locomotives. A story by amaBhungane and Scorpio also suggests that CSR is paying a facilitating fee to a Hong Kong-based company owned by Salim Essa, who is alleged to have strong ties to the controversial Gupta family. The report indicates that Essa’s company is receiving R10-million for each R50-million locomotive that Transnet is buying from CSR. CEO Siyabonga Gama said on Monday that Werksmans would be working with auditors to complete the probe within three months. • Investigating whether one of Transnet’s suppliers had a third-party agreement with another entity in Hong Kong. • Whether Transnet followed its own processes when adjudicating the 10-64 contracts and whether any of these were breached. • Testing allegations of overpayment for the locomotives. • And an investigation into whether Transnet received full value from the financing package, including whether commissions paid were market related. Detailed questions had already been sent to CSR regarding the allegations and Gama reported that the company had “so far refuted most of the allegations”. Nevertheless, he acknowledged the seriousness of the allegations and said Transnet would act should there be any evidence of corruption. “The board has seen it fit that the allegations must be probed. 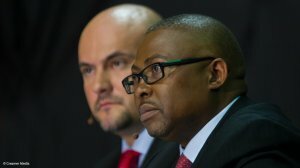 There are serious allegations that have been made against the company, as well as current and former employees of Transnet,” Gama admitted. He refused to elaborate on Transnet’s position regarding the allegations, saying only that the company would report to stakeholders once the investigation was complete. Gama was more forthright in refuting reports that CSR was failing to honour its local-content commitments, describing the claim as “not true”. Recently published research commissioned by independent economic research institution Trade and Industrial Policy Strategies (TIPS) alleges that not one of the CSR locomotives being procured by Transnet had yet been assembled locally. Conducted for TIPS by the Centre for Competition, Regulation and Economic Development, the report says the findings have been verified by scrutinising South Africa’s import bill for locomotives, which has grown significantly. “The imports were less than $50-million per year through 2013, but then climbed to $100-million in 2014 and $550-million in 2015.” However, the researchers acknowledge that the contracts always allowed for some of the initial locomotives to be produced offshore. Instruction notes issued by the National Treasury state that local content for electric locomotives should be above 65%, while the threshold stood at 55% for diesel locomotives. CSR had committed to supplying only 40 of its 359 from China, with the balance to be produced in South Africa. CNR, meanwhile, had contracted to produce the first 20 in China and the remainder of the 232 domestically. GE built six locomotives in the US and the balance of the 233 in South Africa, while BT committed to producing all 240 locomotives in South Africa. “As at the end of June, we had received 240 locomotives under the 10-64 programme that have been built. That is 139 from GE and 101 from CSR, operating effectively and efficiently. And we have two locomotives each from CNR and BT that have been delivered and are going to acceptance testing,” CFO Garry Pita said. The Department of Trade and Industry had assigned responsibility for verifying local content to the South African Bureau of Standards, but Transnet had appointed PwC to conduct ongoing assessments of whether supplier development obligations were being met. “In fact, local content is growing,” Gama insisted, noting that not one of the four suppliers had been issued with penalty letters relating to under delivery on local-content commitments.